World of Warcraft Gold Guide - How To Make Gold in WOW: Site update and changes + Competition! Site update and changes + Competition! No, I am not dead! *checks pulse to verify* I have had a small pause from world of warcraft, so I haven't had the opportunity to post new gold making tips recently, apologies for that. This is not a gold making post either, but I'm just letting you know that this blog is not dead and never will be. New gold making tips coming soon (tm)! There's also changes coming to Loot Hunter. I've been slacking to update it for MOP, but when I finally do update it, it will be 100% free to use, just like this blog is. At most you might see a few ads there and there, but there is no longer the need to pay or fill surveys to unlock the content. There will also be graphical updates to both Loot Hunter and this blog at some point in the future, including a totally new template for better viewing experience. Suggestions are always appreciated! Is Loot Hunter or Kuja's Gold Mine lacking something you'd like to see? Send feedback! Contact details can be found on the "Contact Kuja" page. Let's kick the week going with a cool competition that has lots of shiny rewards! 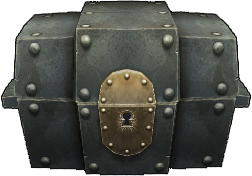 All you have to do is guess what's inside the treasure chest on this page, and either contact me via email or leave a comment below. Click on the G +1 button and share this post or website on facebook by using the buttons on the left if you haven't already. Rules: Only 1 guess per person. No anonymous comments. Don't skip step 1, as should you win, I will verify the date of the share. If no one guesses right, this competition will continue in the next gold making post, and the one after that. If there is no right answer then either, the competition ends. You can participate again in the new posts even if you have guessed in this post for example. There will be prizes for everyone that gives the correct answer and follows the rules. The value of the prize depends on how many gets the answer right. These prizes are all related to WoW somehow. Perhaps 2 years worth of gaming time, a lump of coal or 500k gold on the realm of your choice? Give it your best shot and if you're lucky, find out what the prize is! You scared me for a moment there, I thought you're not coming back any time soon. As for the box, sheesh. Jack-in-the-Box? I think it is a spectral tiger. I bet there is a potato! lol just kidding i bet there is some gold and an ultra Epic Mount. I bet there is some gold and an ultra epic Item/MOUNT!!! Pretty sure it's something like 500k or Spectral Tiger. Or perhaps even a Phosphorescent Stone Drake? I think its only the most epic Mount in WoW history, Ashes of Al'ar! that and 500k gold. Now that's a treasure chest id LOVE to open! I think its a magic rooster.